When Justin Quintana-Scott’s home in Beulah, Colo. was destroyed in a fire in January 2012, he lost not only his house, but his two dogs as well. The mountain community of Beulah came forward in support by holding a fundraiser and erecting a memorial – gestures Justin will never forget. He is repaying his community’s kindness in part through his involvement with Mile High Youth Corps-Pueblo. “I saw how my community stepped up and pulled together to help us out. It inspired me to help more,” says Justin, who joined Mile High Youth Corps in June. A member of the Apache and Navajo Indian tribes, Justin is a sophomore at Colorado State University in Pueblo. He is studying wildlife biology (he made the Dean’s List this year) and has dreams of working for the Division of Parks and Wildlife. He is getting valuable work experience through youth corps, building on an innate interest in the outdoors. “I’ve always been around wildlife – including bears, deer and mountain lions. I’d like to work closely with wildlife, and make it so that the next generation will have access to that too,” he says. When we tell you that 1,521 high-efficiency toilets were installed by Mile High Youth Corps in 2011, will you remember that statistic tomorrow? Does the fact that 34% of corpsmembers are women and 66% are men stick in your memory? Now let’s attach graphics to that data – does the information impact you more, or less? Infographics are an effective way of illustrating program impacts and outcomes. Check out the power of Infographic and Data Visualization with Mile High Youth Corps. 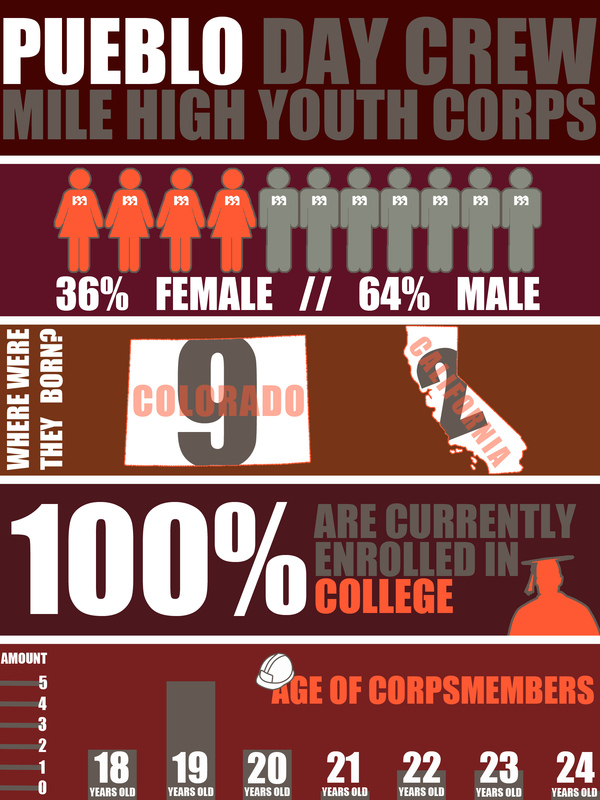 View this infographic for the Mile High Youth Corps Pueblo Day Crew. If you’ve been following the news this summer, you’ll see it’s been dominated by updates of the wildfires raging throughout our state. At both the local and national levels, the broadcast media have tuned in to the great work youth corps are doing to proactively help with fire fuel mitigation. In early July, Southwest Conservation Corps made headlines in a story about military veterans who are working with SCC. The producers interviewed several veterans along with SCC staff members Kevin Heiner and Timothy Foulkes. Check out the CNN story. The next day, KMGH Channel 7 in Denver visited a fuel mitigation project in Genesee Park. Kelly Causey of the Mile High Youth Corps and Andy Perri of Denver Mountain Parks were interviewed – and the story included appreciation for funding from the Colorado Lottery. View the Channel 7 story. On July 12, Boulder County Parks & Open Space Director Ron Stewart and Boulder County Commissioners Cindy Domenico, Deb Gardner and Will Toor recognized the Boulder County Youth Corps, Parks & Open Space employees and volunteers who built the Fourmile Canyon Link Trail at Betasso Preserve Open Space. The Trail Construction 1 Team worked on the new trail last summer and was introduced and thanked for their hard work at the ceremony and joined in the ribbon-cutting festivities. If you're a Facebook user and would like to keep up with what's going on at CYCA and youth corps around the state, please join us on Facebook!.